Russia opposes arms embargo to Syria — Sending warships for a port call. MOSCOW, Nov 29 (Reuters) – Russia opposes the imposition of an arms embargo on Syria and believes the international community should stop threatening Damascus with ultimatums, local news agencies quoted Foreign Minister Sergei Lavrov as saying on Tuesday. 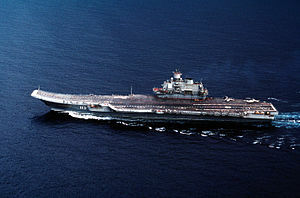 Russia will send a flotilla of warships led by its only aircraft carrier to its naval base in Syria for a port call next year amid tensions with the West over the Syrian crisis, a Russian report said Monday. A naval spokesman confirmed the plan to send the ships but insisted it had nothing to do with the deadly violence in Syria between forces loyal to President Bashar Assad and the opposition. This entry was posted on Tuesday, November 29th, 2011 at 08:12 and is filed under Main Postings. You can follow any responses to this entry through the RSS 2.0 feed. You can leave a response, or trackback from your own site.